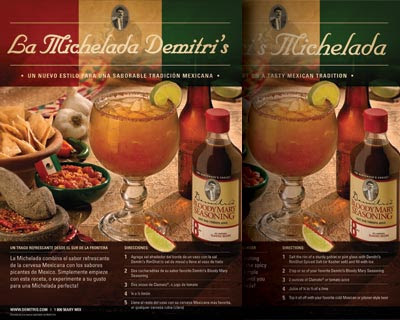 Design Hovie Studios has designed new ads promoting Demitri's Michelada. The ads are done in English and in Spanish. Longshot Apparel, makers of high end shirts for tall (not big) men, have officially launched their online store. 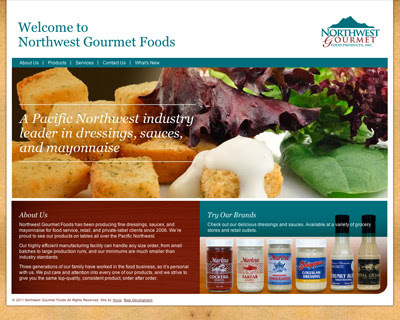 The site was designed by Design Hovie Studios and developed by Bear Group. 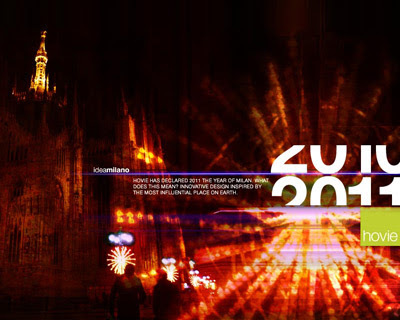 Design Hovie Studios has designed the new promotional notebook for Great China. 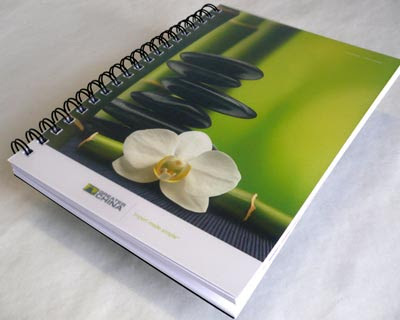 The notebook includes a mini brochure that highlights Greater China's expertise in the import industry. 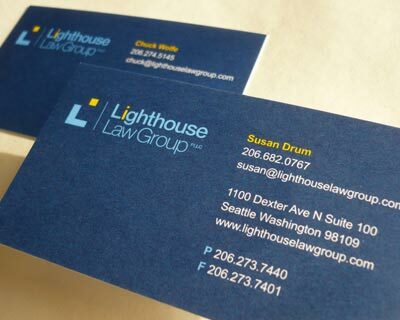 Design Hovie Studios has become part of the first leg in a very interesting plan being implemented by fellow Seattle design firm Wolken Communica. Wolken Communica, also known as Studio Gypsies, decided to give up its studio in order to change how they work how they look at the world and to challenge themselves on a daily basis. They travel like gypsies with their laptops, moving from one host to another switching their view every month or two, gaining inspiration and friends along the way. Given Design Hovie Studios' long history with Wolken Communica (the companies have shared studio space twice before), it was a nice fit for them to start the journey here with us. We are excited to be part of the plan and enjoy the creative atmosphere having them in our studio creates. 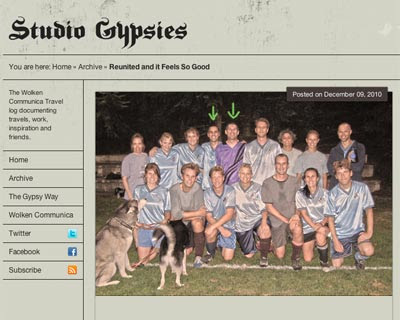 Read more about it on the Studio Gypsies blog. 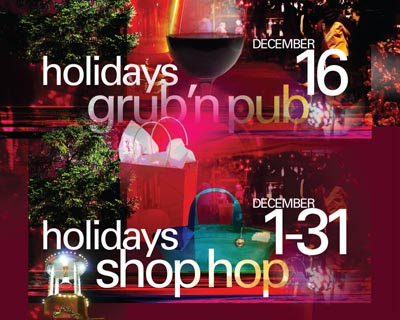 The banner Design Hovie Studios designed for the In Ballard Merchants Association's Holidays in Ballard Celebration was in full use at Saturday's Santa in Ballard event. The banner, seen here on the side of the horse drawn hay ride wagon, includes the logos from the major event sponsors. 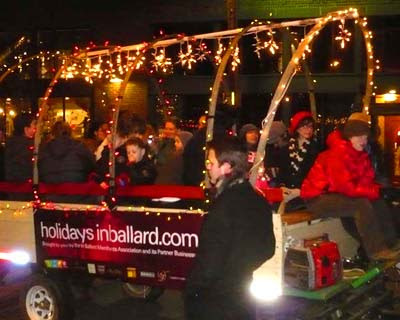 The event was a huge success bringing in a crowd of over 500 to the historic old Ballard shopping core. 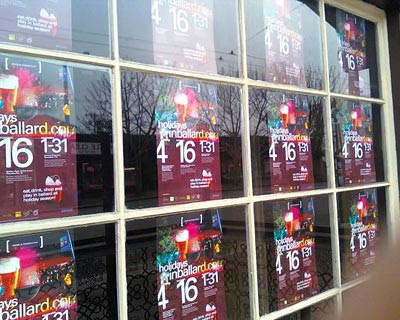 The Design Hovie Studios designed posters for Holidays in Ballard are popping up all over Ballard. Here's a shot of great use of windows of the old Market Street Traders location.